Cheery and diminutive, the British actress May Hallatt only appeared in a handful of prominent movies in her thirty year career, but she managed to create some memorable characters along the way. A versatile actress with stage experience she could be spotted in some notable box office favourites as well as works by such eminent writers, including Dickens, Jane Austen and Mark Twain. Born Marie Effie Hullatt in Scarborough, England, on May 1st 1876, May Hallatt made her screen debut in 1934, although her first role of note came five years later when she played the wife of Wilfred Hyde-White’s Lord Battersby in ‘The Lambeth Walk’ (’39). A jolly little musical based on the play ‘Me and My Girl’; it told the story of a lowly cockney (comedian Lupino Lane) who unwittingly inherits a title and castle. After playing a canal boat worker in Charles Crichton’s Ealing Studio quickie ‘Painted Boats’ (’45), Hallatt’s first memorable role was as the feisty caretaker Angu Ayah in Powell & Pressburger’s religious drama ‘Black Narcissus’ (47). Following bit parts in the music hall drama ‘Trottie True’ (’49) and the excellent ‘The Pickwick Papers’ (’52), May played an eccentric passenger on board a train packed with gold, in the mediocre ‘Lady Vanishes’ knock-off ‘The Gold Express’ (’55). The role that Hallatt will forever be remembered for is her wonderful turn as the solitary Miss Meacham, in Delbert Mann’s Oscar-winning drama ‘Separate Tables’ (’58). A part she originated on stage, Hallatt was a joy to watch and stole every scene she was in as the shuffling, sports-loving spinster. Other notable movies at this time included Alec Guinness’s pet project ‘The Horses Mouth’ (’58), and Jack Clayton’s superb adult drama ‘Room at the Top’ (’59). After playing chatty neighbour Mrs Bates in a 1960 television production of Jane Austen’s ‘Emma’, Hallatt had a small yet funny part in the terrific Terry-Thomas comedy ‘Make Mine Mink’ (’60). 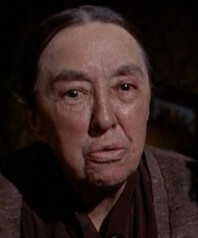 Aged 87, Hallatt’s final movie appearance was as aunt Sarah in the entertaining drama ‘Bitter Harvest’ (’63), which starred the tragic Janet Munro as a young Welsh dreamer in search of happiness. The mother of familiar Seventies actor Neil Hallett, May died in London on May 20th 1969, she was 93. Another of those wonderfully eccentric characters, May Hallatt only appeared in a couple of dozen features, but she brought so much to even the smallest of roles, and I think she would have made an ideal tweed-wearing Miss Marple.